LOCATION.--Lat 41`03'06", long 77`36'17", Centre County, Hydrologic Unit 02050204, on left bank 0.4 mi downstream from Foster Joseph Sayers Dam, 0.7 mi upstream from Marsh Creek, and 0.9 mi south of Blanchard. PERIOD OF RECORD.--May 1954 to current year. Prior to October 1967, published as North Bald Eagle Creek at Blanchard. 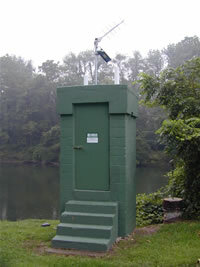 GAGE.--Water-stage recorder, crest-stage gage, and water-quality monitor. Datum of gage is 579.79 ft above National Geodetic Vertical Datum of 1929. COOPERATION.--Station established and maintained by the U.S. Geological Survey. Funding for the operation of this station is provided by the U.S. Army Corps of Engineers, Baltimore District and the U.S. Geological Survey. REMARKS.--Flow regulated since March 1971 by Foster Joseph Sayers Dam (station 01547480).